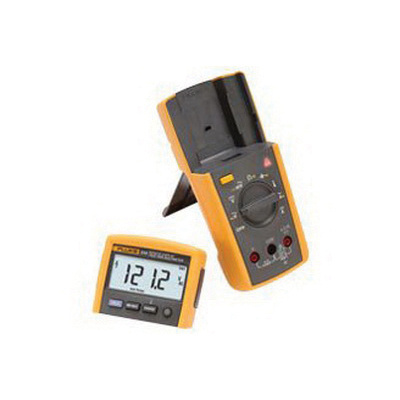 Fluke Remote display multimeter offers true-rms ac voltage and current for accurate measurements on non-linear signals. It has voltage rating of 0.1-Milli-Volt - 1000-Volts AC/DC at 5-Hz - 50 kHz and current rating of 1-Milli-Amp - 10-Amp AC/DC. The mulitmeter has low power wireless technology that permits the display to carry up to 10 m away from the point of measurement for extra flexibility. It has a capacitance of 1 nF - 9999 micro Farad and resistance of 0.1-Ohm - 40-Mega-Ohm. This conventional multimeter maximize visual focus on probes and offers safe electrical measurements. It includes easy to read display with large digits and bright backlight. This multimeter provides measurements in hard to reach places, access restricted areas such as clean rooms or hazardous areas.